Independent crime writer/director, Kevin Jamison, is working on his next film, Serial: Girl’s Night Out. It is the second chapter in the life and crimes of highway serial killer and sociopath, Trenton Wade Bracks. Trenton is a fictional serial killer, but Jamison has based him on a number of real life killers. The first chapter, Serial: Amoral Uprising, shows Trenton’s traumatic childhood and the killer it made him become. This 58 minute short gives us a step-by-step look at his rise in to mayhem. Even once he becomes this monster Trenton fools everyone. He appears to be charming, polite, and a real catch. He turns in to another animal altogether once he gets the girl out of the safety of the public eye. Trenton let’s his true nature take over in the most brutal sense possible. Serial is widely inspired by films such as Henry: Portrait of a Serial Killer, Maniac, Kalifornia, and true crime writer, Ann Rule’s, work. Serial: Amoral Uprising premiered at The Horror Society’s Summer Slaughterfest in Chicago, the film has received high praise and attention from publications like HorrorNews.net, HorrorYearbook.com, Dead Pit Radio, HorrorSociety.com, DreadCentral.com, and BloodyDisgusting.com. View the Serial: Amoral Uprising trailer here. Serial: Girl’s Night Out picks up five years following the first film. It continues the trickery and slaying of serial killer, Trenton Wade Bracks. These fictional killer is highly influenced by real life cases of Ted Bundy and Henry Lee Lucas. Girls Night Out tells the horrifying story of two sorority sisters from the University of Memphis who run in to the vicious serial killer himself while out on a seemingly innocent “girls night out”. I will be featured in the film as one of the three main girls along with the talents of Deneen Melody and Colleen Miller as well as Kaylee Williams. Christopher Howell is reprising his role as Trenton Wade Bracks. Girl’s Night Out is serves as a way to venture forward in to Trenton’s world while Kevin Jamison waits on the budget for a feature Serial film to come through. Jamison’s production company, Black Eye Entertainment, along with co-producer Mitchell Wells of HorrorSociety.com, will use film festivals, magazines, and genre conventions, and online marketing until the film gets distribution. 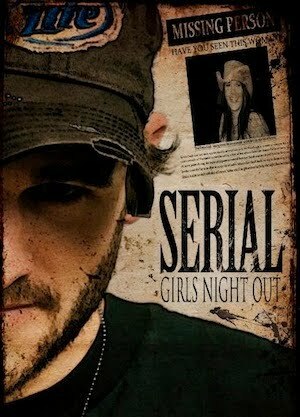 Serial: Girl’s Night Out will be available once post-production wraps later this year. For more information on Girls Night Out, Amoral Uprising or updates regarding the status of the Serial project please feel free to visit the film’s official website at www.serialthefilm.com. THE SAINTS HIT COMIC CON!! !